A RECORD RAINFALL OF 0.62 INCH(ES) WAS SET AT FRESNO CA YESTERDAY. THIS BREAKS THE OLD RECORD OF 0.50 SET IN 1982. November 30 Update: Crescent City peaked out at 4.14" of rain yesterday, more than doubling the old record. Ukiah almost doubled its old record with 2.48", vs. 1.42" in 1938. A RECORD RAINFALL OF 2.22 INCH(ES) WAS SET AT MEDFORD OR YESTERDAY. THIS BREAKS THE OLD RECORD OF 1.25 SET IN 1917. A RECORD RAINFALL OF 1.6 INCH(ES) WAS SET AT ROSEBURG OR YESTERDAY. THIS BREAKS THE OLD RECORD OF 1.43 SET IN 1951. A RECORD RAINFALL AMOUNT OF 2.50 INCHES HAS FALLEN SO FAR TODAY. THIS BREAKS THE PREVIOUS RECORD AMOUNT OF 2.00 INCHES SET IN 1995. Since that report was issued at 4 pm local time, over one and a half inches of additional rain has been unofficially reported. Crescent City climate records began in 1894. At Mt. Shasta, the 1.69" as of 4 pm was closing in on the record of 1.81" from 1932, and since then at least three-quarters of an inch of additional rain has fallen. In Oregon, Medford's 1.58" as of 4 pm was enough to break the record of 1.25" from 1917. November 30, 5 PM Update: Added 2012 monthly data and charts. 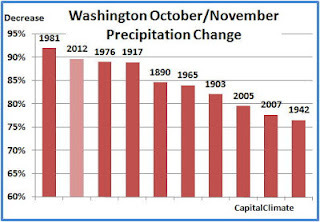 With the mere 0.06" of light rain on Tuesday, November 2012 will close out tomorrow with only 0.60" of precipitation at Washington. 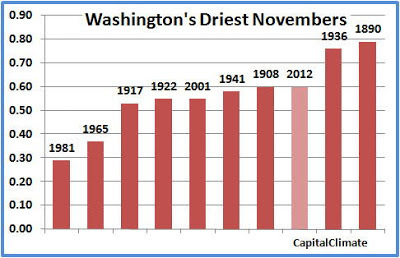 That ties it with 1908 as the 7th driest November in 143 years of climate history. The driest was in 1981, when 0.29" was reported. This exceptionally dry month, following the 5.82" drenching in October, represents slightly less than a 90% month-to-month decrease, second only to the 92% in 1981. 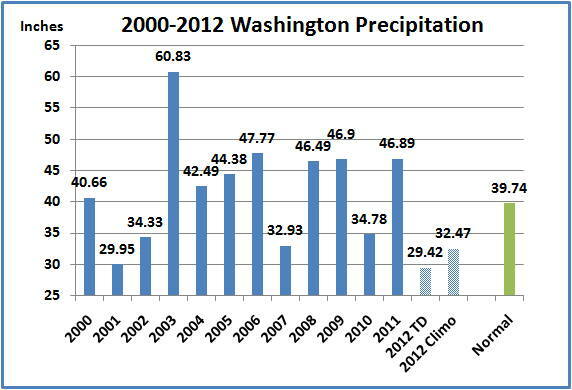 In absolute terms, the 5.22" rainfall reduction is the 5th largest on record. 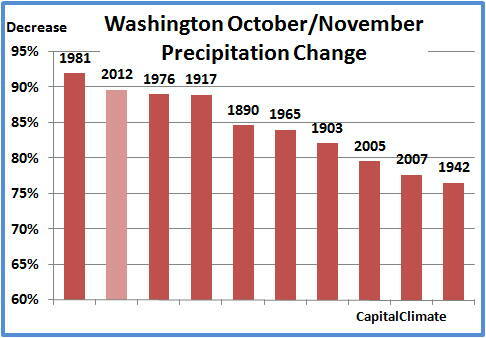 The largest absolute October-November decrease was 7.49" in 2005, following the all-time wettest October. 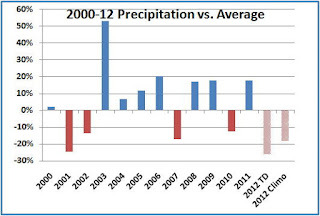 Following wetter-than-average months in September and October, this is now the 9th month of 2012 with below-average precipitation. The November departure of 81% below average is followed by March with a 71% deficit. 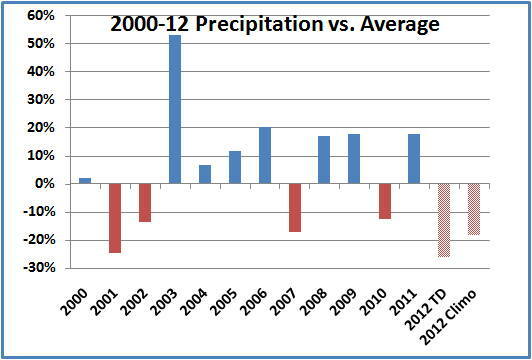 The 29.42" total precipitation through the first 11 months is over 7" below the average amount to date. 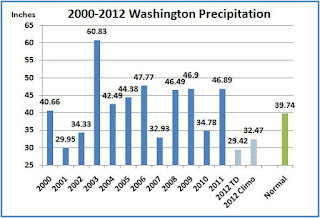 If December rainfall is equal to climatology, the annual amount (marked "Climo" on the chart) will remain the second driest since 2000, behind the 29.95" in 2001. Of the 13 years so far this century, only 4 others have been below average. November was very dry throughout the Mid-Atlantic region, with nearly all areas below 50% of normal. Large areas from Washington eastward and southward have been below 25% of normal. The 0.71" at Baltimore is less than 22% of normal, and the 1.12" at Dulles is 33% of normal. Richmond's 0.27" is 8% of normal and the 5th driest in records dating back to 1872.